We're on the move again today, this time to explore Ryugado Cave, stop briefly at Okabe Gorge before driving up for a night within the secluded Iya Valley. We got up pretty early this morning and enjoyed a good free breakfast as we were staying at a Comfort Inn. After checking out at reception we then drove off to the Ryugado caves, which took around 40 minutes. Along the way we saw lots of signs about the nearby Anpan Man Museum, which is dedicated to the classic Japanese kid’s picture book and anime about a man whose head is made out of a bun filled with red bean (azuki) paste. Anyway, we arrived at Ryugado just after 09:00 to find a near empty carpark and few people around. The route to the cave from the carpark went through a line of shops, but they were mostly all shut at this relatively early hour. Interestingly there was an outdoor escalator you could ride up to the cave entrance. It was a little strange to have it on the side of the mountain here in the first place but considering it just lead to the caves which had lots of stairs and such inside I wondered what justified its installation. Anyway, we paid 1100 yen at a booth and then entered the caves. The Ryugado cave system is one of Japan's three biggest and three best caves, and is the second of that set we've visited having visited Akiyoshido last year. The cave is around 150 million years old and home to around one hundred different animal species such as bats, shrimp and crabs. Ryugado cave was recently discovered in 1931, but someone obviously knew about its existence long before as, discovered in the caves, were numerous, nearly intact earthenware pots dating from the Yayoi period (300 BCE - 300 CE). These discoveries quickly led to the caves designation as a national treasure and national historic site in 1934. The caves are around four kilometres long in total, and a very long one kilometre is open to the public for viewing. In addition to this regular route there's also an adventure course, though we sadly didn't do this as you have to book in advance. It looked really good with ropes and such so is definitely something we'd like to try another time. The regular course was still really fun though and there were heaps of narrower sections we enjoyed squeezing through as well lots of stairs up and down. There were not as many speleothems as some other caves but still quite a few good ones including the eleven metre high Tenko-seki or Rock Descended From Heaven. Some were even lit up with coloured lights. The most interesting structure though was the Pot of God, which was a pot left behind from the Yayoi period that has, over the years, became completely encased in limestone! At this point (and a few others) there was a Japanese staff member explaining about the features. A welcome contrast to recent conditions was that the air inside the cave was quite cold - around 15 degrees. There was also a fair amount of water in the cave, dripping from the ceiling and flowing along underground streams. After a good exploration we came out of the cave higher up the mountain and followed the path back down to the bottom. At the end of this path there is some sort of bird park, though we didn't go in as it's another example of a cruel Japanese Zoo were the animals are trapped inside tiny cages with no room to move. There's also a free museum here but we didn't go to that either and instead hopped back in the car and drove to Oboke Gorge to stopped in at the Lapis Oboke rest house. This stop was right on the river and we were able to get a decent view of the gorge from the outside veranda. Inside we found some tourist information, a shop, a restaurant as well as two small museums we paid 500 yen to visit. The first was a Youkai or Japanese Ghost/Monster museum that had lots of exhibits with statues, dolls and puppets of the various monsters from Japanese folklore. Unfortunately photos were prohibited in this museum. The second floor museum held a decent collection of rocks and minerals! I really enjoyed the geological museum and the best exhibits included a huge meteorite you could touch, some molybdenite from Australia, a rare Martian meteorite (rock from Mars), as well as a really cool lithophone. 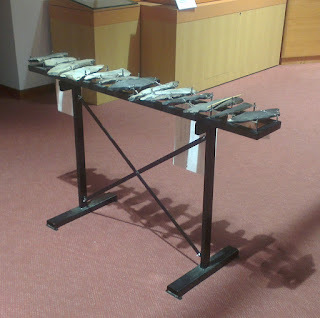 It was just like a xylophone or glockenspiel but instead of wood or meal each block was made out of a different rock and rang out with the appropriate note when struck. You can do quite a few gorgy activities at Okabe, such as white-water rafting and canyoning, but instead of that we continued on and drove into Iya Valley. Just before heading into the main part of the gorge, we stopped off at another smaller roadhouse to have a go at some ladybug ride. Actually, as a matter of fact tonight's Ryokan hotel was located right across the road from here. The lady bug ride had a bunch of little lady big cars attached to a monorail track that went up, down and around a hill. We bought some tickets for the ride from a bit of a forlorn looking lady at the information desk and then walked out to where the ride was. It was dead quiet and we were the only people at the roadhouse so there was no one operating the ride. While we were wondering the desk lady ambled out. You could have two people in one bug, but we were advised to take separate bugs. It's probably a ride mainly for children. Anyway. After hopping in, we slowly starting making our way up the hill through the greenery for a good view down over the valley and also across to our hotel. Coming back down from the top was actually a little scary, especially for me at the front as it was not 100% certain I would not go rocket down the hill- either by design or otherwise. It was pretty clear that would not happen as there were no seat belts but still!! After the ride we then hopped back in the car and drove up to Iya Valley's famous peeing boy statue. Apparently it was installed as lots of people would demonstrate their bravery by peeing of the 200m cliff. The road up was very narrow with barely enough room for one car in many places even though the whole distance was a two way road. There were also many blind curves. Along the way we passed a Ryokan on the side of a hill that had a very cool 55 degree angle cable car which ferries passengers down the hill to onsen at the bottom of the cliff. Arriving at the statue we found a couple enjoying the view. The guy had a camera harness on and dozens of cameras and a whole car boot full of camera equipment and tripods. It looked like they'd already been there a while, and although the lady wasn't interested in the photography she seemed to be content with wistfully staring into the distance. Among other photographic activities, the guy also spend a lot of time lining up the camera on a huge tripod so they could take a photo of themselves. We had a look at the little statue, which was indeed on the edge of a big drop and was scary to approach. I also spent some time taking some photos, one of which is at the top of this post. The statue generated a decent amount of traffic, actually not too much in reality (two or three cars at once) but it seemed pretty busy because of the small area on the side of the narrow road. After the statue we drove off somewhere else and stopped in at a restaurant for lunch. Kate got konjac, tofu and fishmeat on a stick glazed in miso, and I got tenpura udon I think. Upon finishing our late lunch we then drove down to bottom of the valley to the Iya Kazurabashi Bridge. This is one of the three remaining suspension vine bridges that used to span the valley. At one point there were 13 and the first one was apparently constructed by Kobo Daishi around 1500 years ago. We actually recently visited his birth place at Zentetsuji. Unfortunately, bridges made out of vines don't last that long, and the remaining ones actually now have steel cables inside for safety. Nevertheless it was still fun going across and we paid 500 yen for the opportunity. Thanks to the many large gaps and open slats it was a little scary walking across 14m above the river below. Although the gaps were not big enough for a person to fit through if you were not careful you could easy get a leg stuck down in the gap and people were crossing with varying amounts of confidence. Once we'd crossed the bridge we then walked down to the river bank where we found a really nice little waterfall. The rocks on and in the river were also great and we spent some time just relaxing by the river. I ended up taking my shoes off so I could splash around in the clear, rapidly flowing river with a few small fish. After it started getting a little cold as the sun began to set, we went back to our car and drove to tonight’s Ryokan the Hikkyo no Yu. 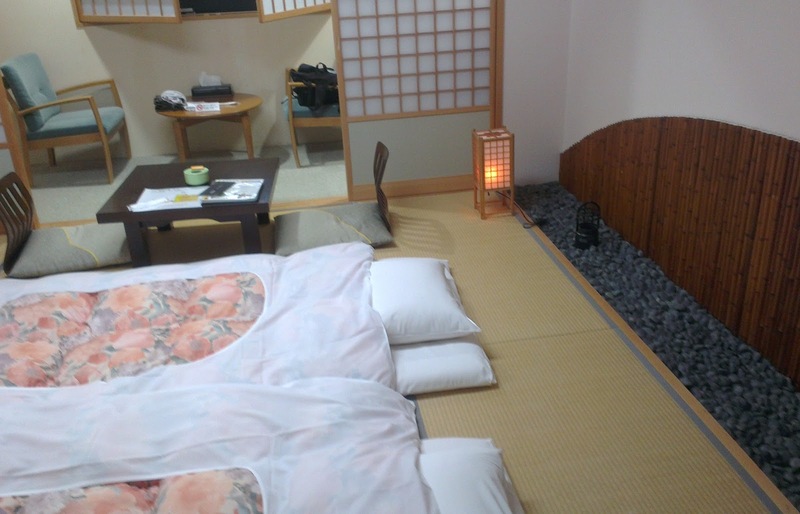 This Ryokan hotel was very large with three separate buildings on different levels connected by catwalks. To get to the baths we had to go down one escalator, walk to the other end of the second building and then go down another escalator- which was like a fun adventure! The big baths in the indoor onsen here are regarded as the best in the valley, and the hotel also had outdoor baths- though the views are not as good as others. 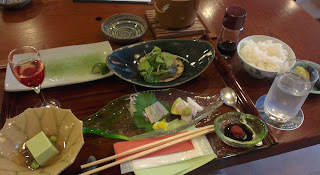 So we enjoyed the onsen and then had a delicious kaiseki meal in one of the meal halls. After our meal we returned to find our futons all laid out for us. Tomorrow we'll be travelling through the much more remote eastern part of Iya valley known as Oku-Iya to visit the other two vine bridges before hiking up the nearby Mt. Tsurugi. Finally, we'll be driving to Tokushima City to enjoy the famous folk dance at night.